Taking Sengoku 15mm Japanese Fantasy and turning it into a rather special piece of 15mm Science Fiction is the subject of the latest post for Allison M who runs the Painting Agency blog. As you can see the SGF23 Rokurokubi with Stretched Neck miniature sculpted by John Bell has undergone a real transformation (see it as it normally is below) becoming Lady Urokubi. You can see the blog post HERE. Excellent work! There are some forty poses in the Sengoku range which to my knowledge makes it the grandest 15mm mythic Japanese range out there in the world. 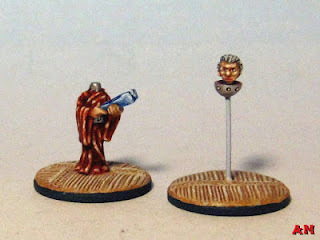 There will be more miniatures for the range this year with a third wave added. In the meantime if you like Oni, Kappa, Tengu, School Girls, Goblins, Warriors, Spider Demons, Ghosts, Ghouls, Snake Monsters and more visit the range HERE. Glad you like it! It's a truly unique fantasy figure, that's for sure. I first encountered "headless" Japanese vampires in a Hellboy comic, the mental image of the heads flying around menacing people really stuck with me. I wasn't aware of the long neck version but it's equally bizarre. I do. Very nice idea. Thanks. Alison's version reminds me of the Moon king & queen from Baron Munchausen !! Its the collars isn't it. I thought that too. Nice! Someone mentioned that on my blog too. I haven't seen the film in ages but I remember it being spectacularly enjoyable. It is an odd film but like Flash Gordon and Tron etc it is rather unique. Well worth a watch again.